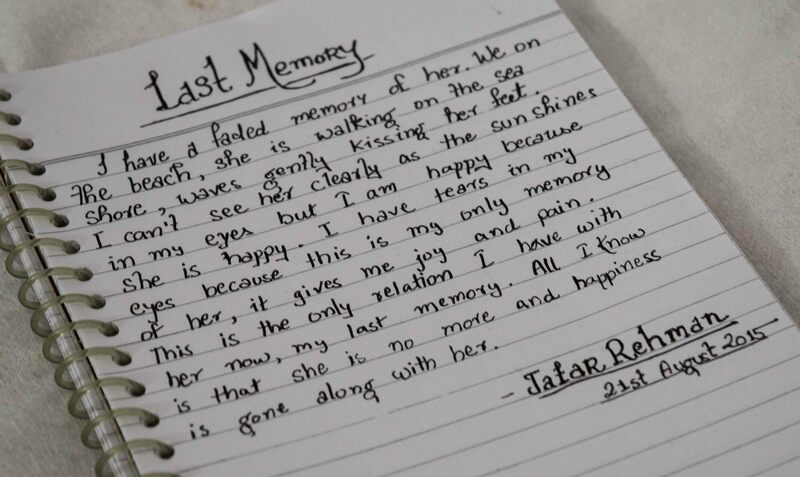 I have a faded memory of her.We on the beach,she is walking on the sea shore,waves gently kissing her feet.I can’t see her clearly as the sun shines in my eyes but I am happy because she is happy.I have tears in my eyes because this is my only memory of her,it gives me joy and pain.This is the only relation I have with her now,my last memory.All I know is that she is no more and happiness is gone along with her. I appreciate the innocence of love you’ve brought up. A lovable one. Ah!! It’s beautiful!! Felt like moving along with your words… Felt your pain!! It is great to know that you find it beautiful. And thank you for the comment. I loved the piece but the PS part made me check the comments, Nobody asked anything! So I’ll ask one, What questions you were expecting? And I hope it was not inspired by any real life experience, If it was, I’ll be even more sad about the post. Oh,I was expecting questions from people I know personally or from people who know me really well. This time they didn’t ask,humans are unpredictable. No,it did not happen for real,it was the work of my mind. That’s good news. May be they got really touched by the piece and so they didn’t!